C'mon now, sing with me! Yes folks, it's November 15th, which means it is National Bundt Cake Day! I never knew such day existed until I read about it on Mary the Food Librarian's blog last year in which she did 30 Bundts in 30 days! It was an amazing feat for sure, until this year when she decided to do it again, and in the middle of it all, single-handedly created a dessert bar for my friend Jun's wedding (Mary wrote about it here). How incredible is that?! I know this little blog of mine has been solely dedicated to my knitting hobby, but I figured what the heck, since I write about being craftsy with yarn here, I might as well write about my occasional craftsy endeavors in the kitchen. Growing up, I never really liked cake with frosting. I'm not sure if it's an Asian thing, but frosting is just too sickeningly sweet to me. I would eat the cake and the filling (usually fruit) and leave the frosting untouched. What a waste! Now the Bundt cake is a different story - there's just a leeeetle bit of icing on top, and more often than not, there is NO icing or just powdered sugar. My Mom made Bundt cakes when I was growing up and we always enjoyed them a lot. Ever since I moved out, got married and now have my own kitchen, I've made plenty of cakes and treats, but it never occurred to me to make a Bundt cake until now! Yes, I am knee-deep in baby sweaters! I'm just knitting them one after another and happily doing so. I think this is the 5th(?) 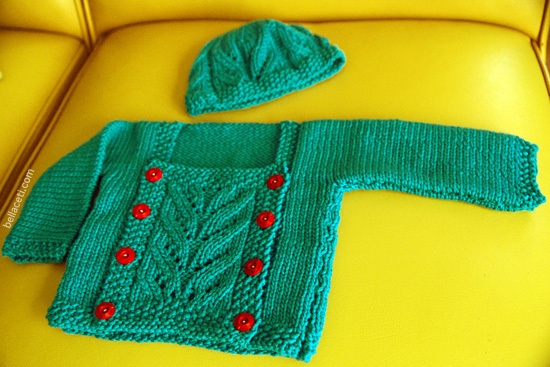 baby sweater I've made this year. It just gives me so much joy and satisfaction to be able to give something special that I've made by hand. This was a new pattern I decided to try, Presto Chango (I know it's "change-oh" but I keep wanting to say "chang-goh"!) by Valerie Wallis, published at Jimmy Bean's Wool. It's a FREE pattern by the way! 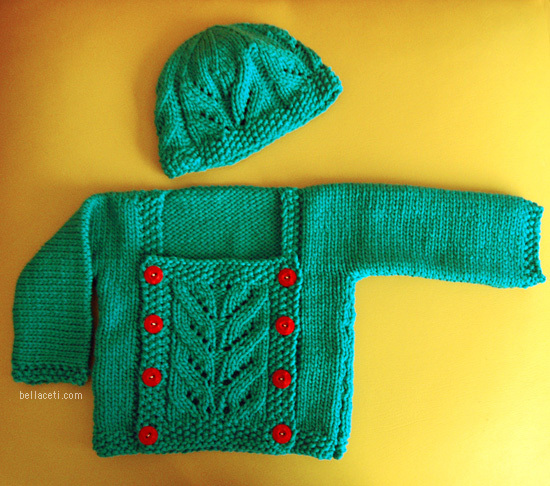 Such a nice and quick knit, and the leaf pattern in the front is so delicate and so pretty. I took the liberty of improvising a hat to go with the sweater - just did leaf panels in multiples of 16, then decreased in multiples of 8. Easy and fun! I'm currently knitting another Presto Chango, but in a much muted color. Hope it turns out just as cute as this one!